Lots of works goes on behind the scenes to get objects ready for exhibition. Mount maker Callum Strong is tasked with creating mounts to display and protect the nation’s treasures. 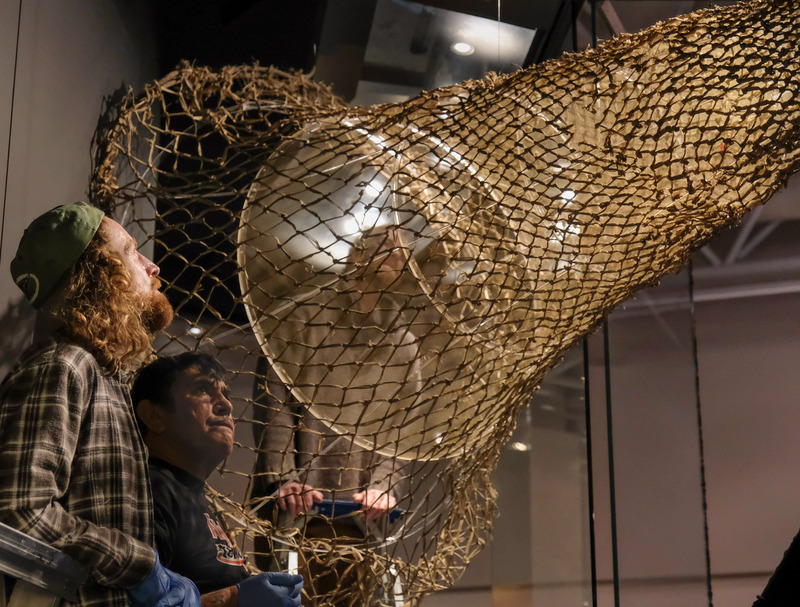 Here he explains the efforts that went into displaying the hīnaki, or eel trap, in our latest iwi exhibition, Ko Rongowhakaata: The Story of Light and Shadow. Mount making involves designing and building supports for objects. Most of the time you don’t notice my work, which means I’ve done a good job! At Te Papa, although the building has base isolation, many objects would still topple without some form of support. Mount makers work across all materials, timber, metals, plastics, foams, fabrics, etc. to make sure objects remain sturdy and safe. We really are the multi-instrumentalists of the tool world. Mount makers work with curators and exhibition designers to determine exhibition case layouts and object orientation. We also work with conservators to analyse material sensitivity and object fragilities. 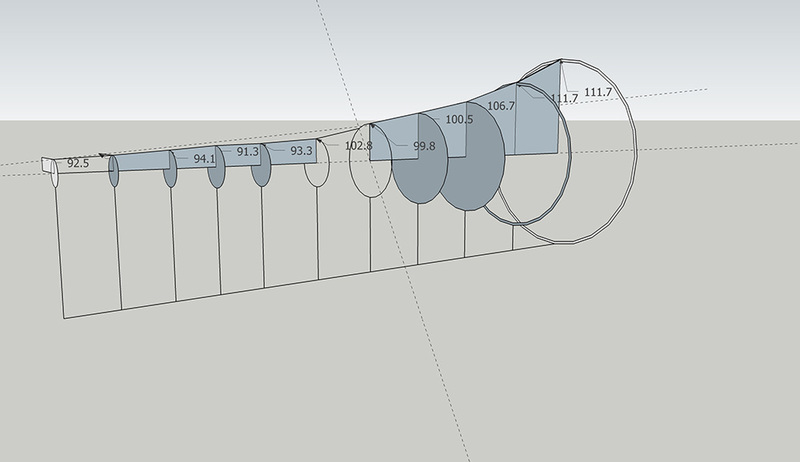 If objects exceed certain dimensions then they also call on expert advice from engineers. 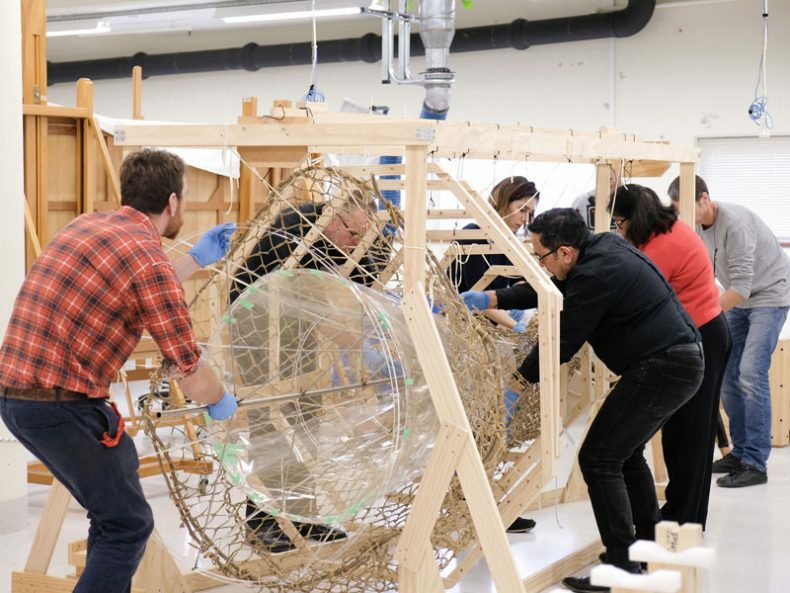 The hīnaki (eel trap) displayed in Ko Rongowhakaata is on loan from the Tairāwhiti museum, and it was agreed that the object was in need of some attention. 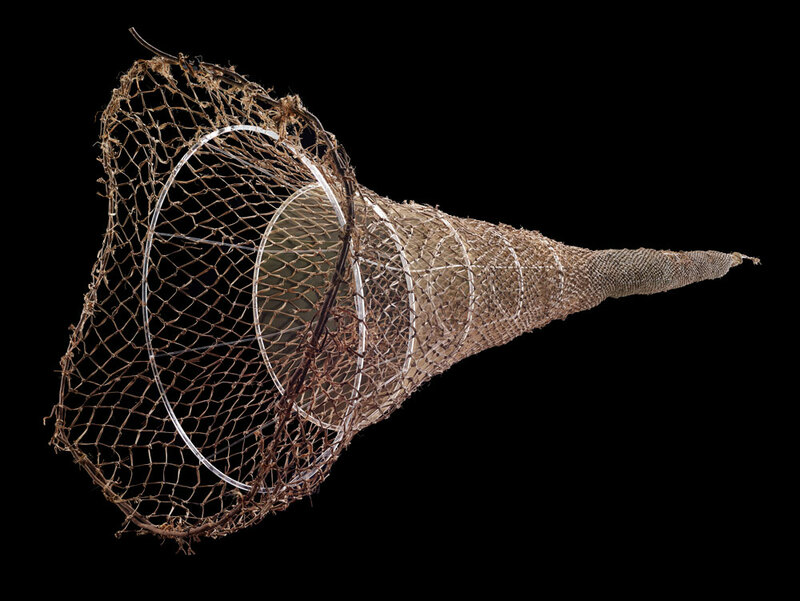 The hīnaki had previously been suspended on flexible wire hoops with black fabric and cushion stuffing to help maintain some form, but over time these mounts had started to deform, stress, and tear its harakeke fibres. 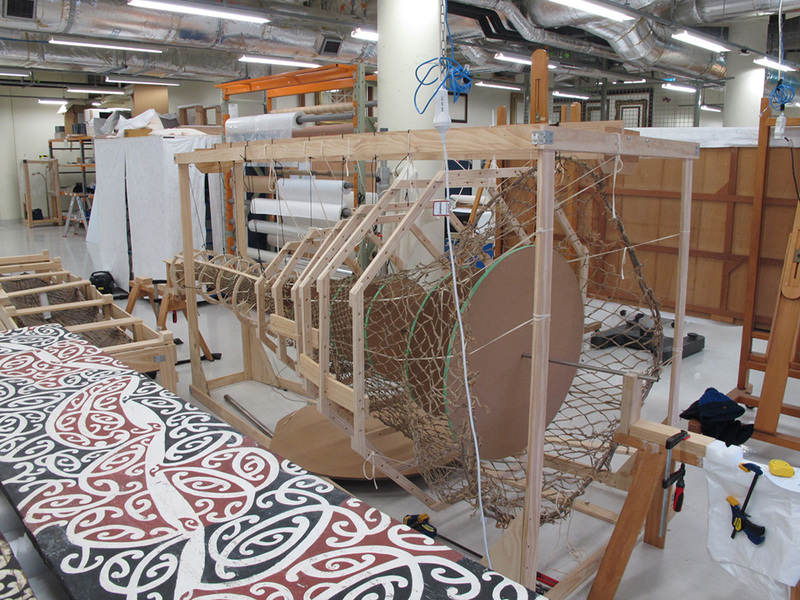 The first task was to remove the old support and coax the hīnaki back into its original form. A giant timber exo-skeleton comprising of hoops with small holes was built around it so that multiple ties could gently pull the hīnaki into shape and stop it from collapsing when the old mount was carefully removed. With the hīnaki’s form held in position, a long steel pole was inserted down the centre line. After much approximate measuring, cardboard disks were threaded onto the pole to validate the internal dimensions. 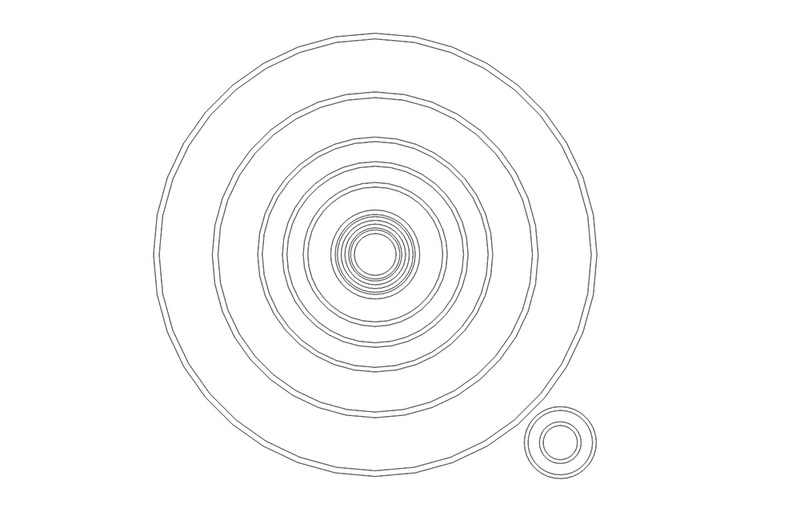 These dimensions were then modelled in Adobe Illustrator to form vector paths for a laser cutter to cut rings within rings out of 10mm-thick acrylic. 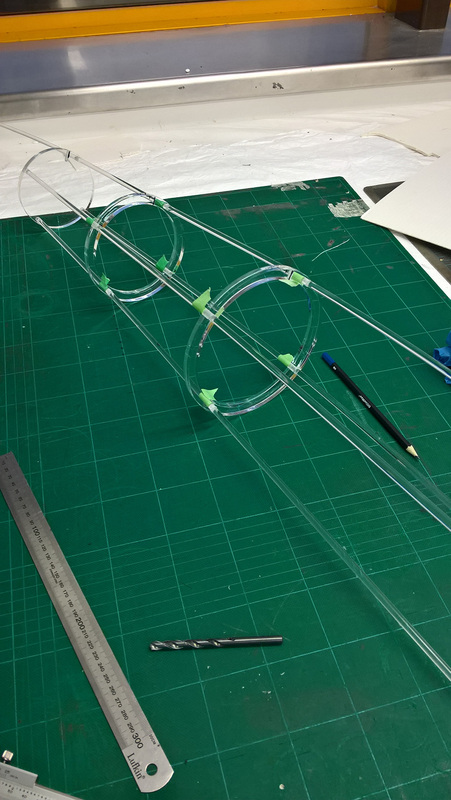 The dimensions were again modelled in Sketchup to work out the change of angle between each acrylic ring matching the funnel-like shape of the hīnaki. 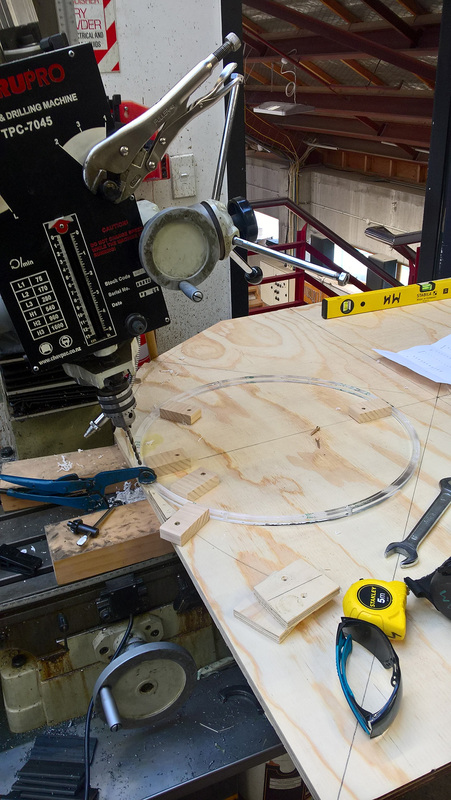 These angles were translated into the drill press as each ring was manually drilled to receive acrylic rods that would connect the whole structure together. It soon became apparent that the acrylic mount itself would require its own support mount as it was being assembled. This also provided stability while a conservation netting was stretched around the acrylic. 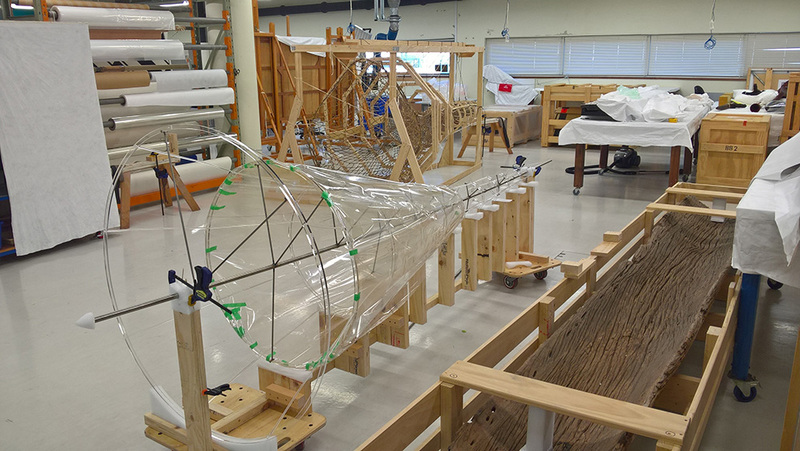 The netting would provide areas to stitch damaged parts of the hīnaki back into place. 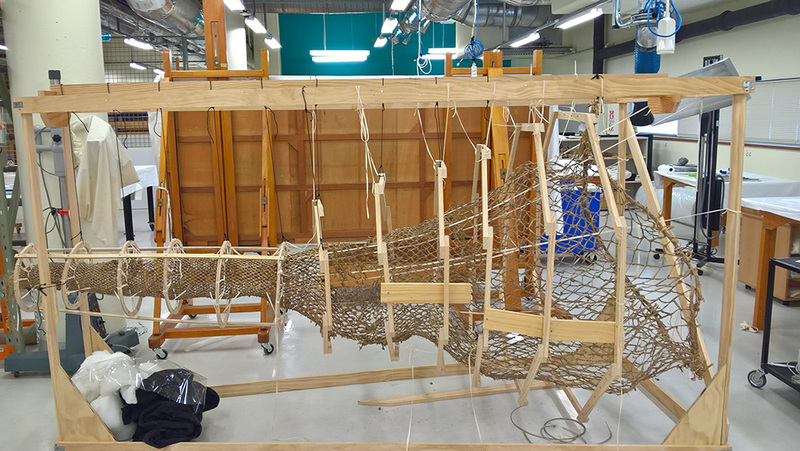 The netting also presented a new challenge: How could we insert the mount into the hīnaki without it snagging on the fibres? The solution was to create a removable slip layer of thin mylar carefully cut to the mounts shape with ‘tails’ to secure and pull to release once the mount was securely in place. The final challenge was how to get the mount in the hīnaki. A mount for a mount of course! A lifting frame was devised that would lift and push the acrylic rings evenly as it was inserted into the hīnaki. With all hands on deck and conducting the installation like an orchestra, the mount was in. With thin black stainless wires supporting the mounted hīnaki the exoskeleton was removed and the hīnaki readied for transit to its Te Papa display case home for the next two and a half years. This was an intensive collaborative project, but a special thank you goes out to Charlotte Jimenez – a conservation intern from France, who not only did many days of conservation treatment and stitching but brought many illuminating ideas to the mount design.